The title of this post is a bit of a misnomer, as I forgot to take photos of the construction. Which is no big deal, as it was very simple, just the lining sewn to the silk embroidered piece and turned right side out. 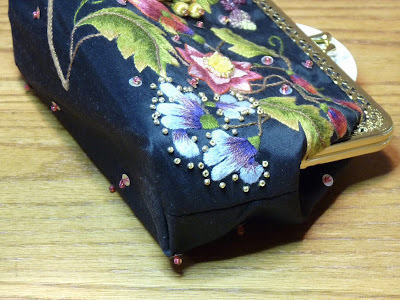 The tricky part was sewing the bag top to the purse frame. I ruined at least two needles doing this. I keep a package of manicure sticks on hand for pushing fabric into tight spots without puncturing the fabric. The sticks are perfect for this. 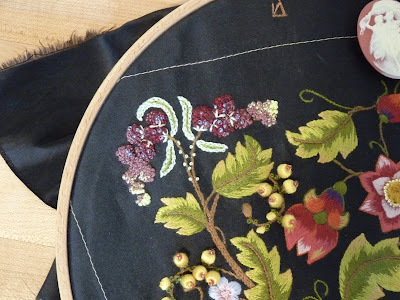 For a long time now, I've been of the opinion that beads make any embroidery, whether smocking, surface embroidery, or counted work, much better and more exciting. I love to add a little bling to the pieces I work on. Evidently, the designer, Susan O'Connor, must feel the sam way, as she uses beads quite extravagantly in this purse. First of all, the yellow berries are made of pebble beads wrapped with thread and secured with a red seed bead on top. The large pink flower looks like it sneezed a few beads. The blackberries are adorned with little blue seed beads to give them a bit of dimension and light. The blue flowers (what they are, I haven't a clue) have lots of gold beads surrounding them. There are more than the pattern specified, so I had to raid my stash to finish the somewhat dense bead pattern that I made. 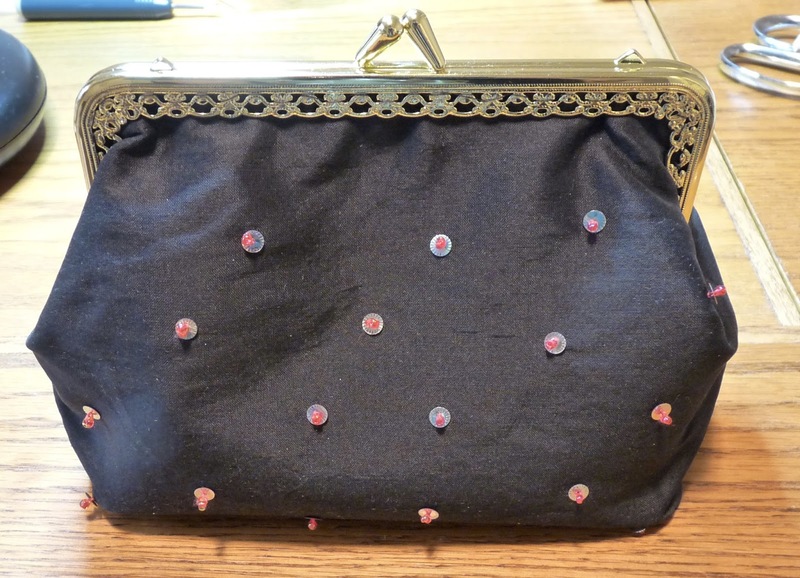 Even the back of the bag has spangles attached with beads. There are a few spangles with beads on the front of the bag as well. And look at the big pink flower on the right, the center is surrounded by beads. The bag is lined with burgundy satin, but all of my photos had too much light reflecting off the hardware, so you will have to take my word for it. I just couldn't get a good picture. If you look closely at the frame, there are two little triangles for a strap to be attached. They are too small for a fabric strap, as the instructions state, and besides, I think I prefer a clutch. Maybe if I find a nice, delicate chain, I might buy one and attach it, but I will decide that later. All in all, I'm pretty pleased with it. It's big enough for a phone, some cash and a lipstick, which is all I need. Now to find a dress to go with it for the Convention banquet! 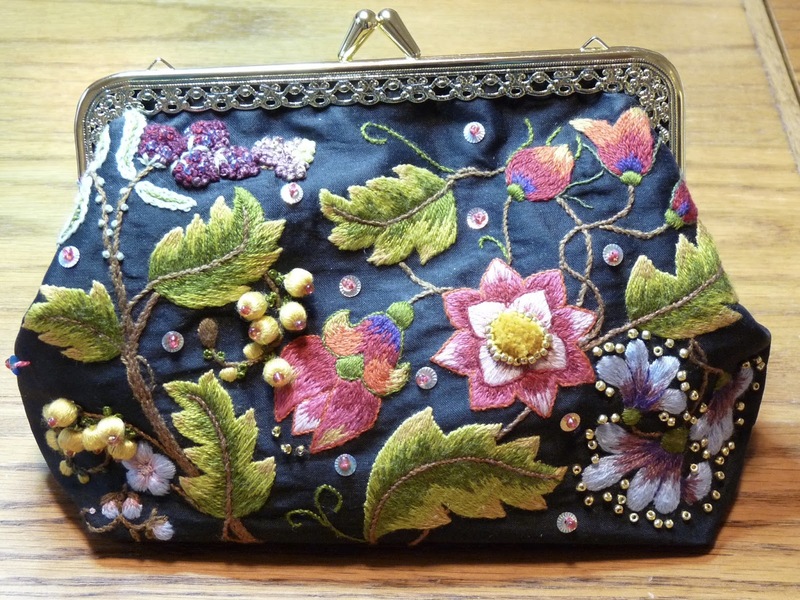 There are just a few finishing touches on the embroidery for the Embroidered Silk Evening Bag. As I was looking at the photo of the finished bag, I noticed that I had completely forgot the leaves and sepals for the blackberries. The chalk markings had completely rubbed off the silk fabric. So I carefully drew them in by hand with a chalk pencil. 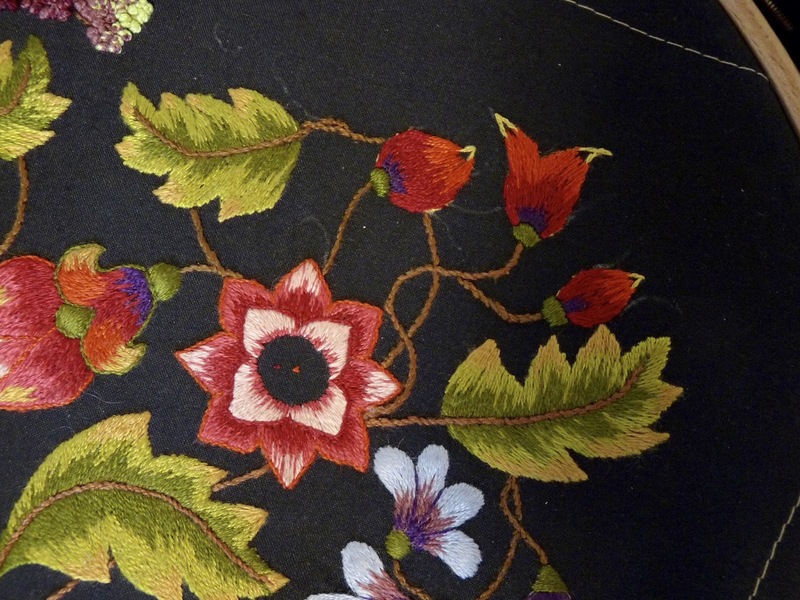 Then I realized that the center thread is supposed to be Au Ver au Soie, Soie d'Alger No 516, a dark green that you can see in the centers of the other leaves above. Unfortunately, I am completely out of it. I looked through my stash and decided No 514 is close enough, so that's what I used. With the lighter green outlining the leaves I think it looks fine. What do the beads represent, pollen? I placed little gold beads around the blue flower spray. I used many more than the directions specified, so had to raid my stash for a few more. Luckily, I have plenty of the same color. 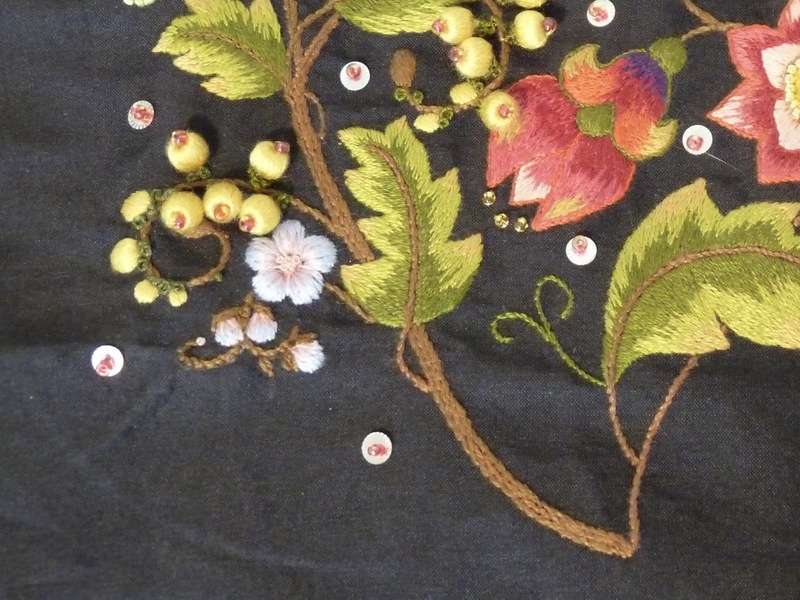 I also filled in the center of the large pink flower with yellow Ghiordes knots and encircled it with beads. In the last post I mentioned that I couldn't figure out what the flower spray below the blue flower is supposed to look like, so I rubbed the chalk away and drew in new markings. Then I added the blue buds with pink accents and a brown branch. 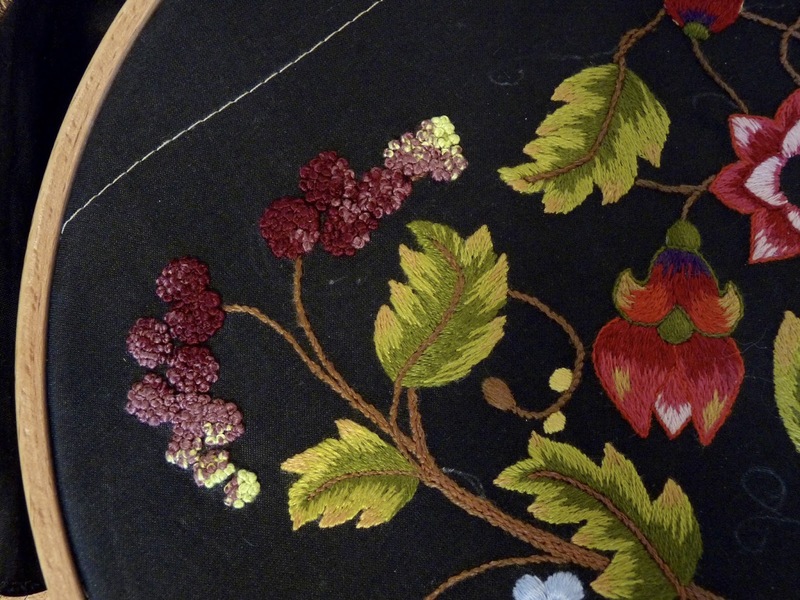 Here is the entire embroidery, all complete. Now I just have to make it into a bag. 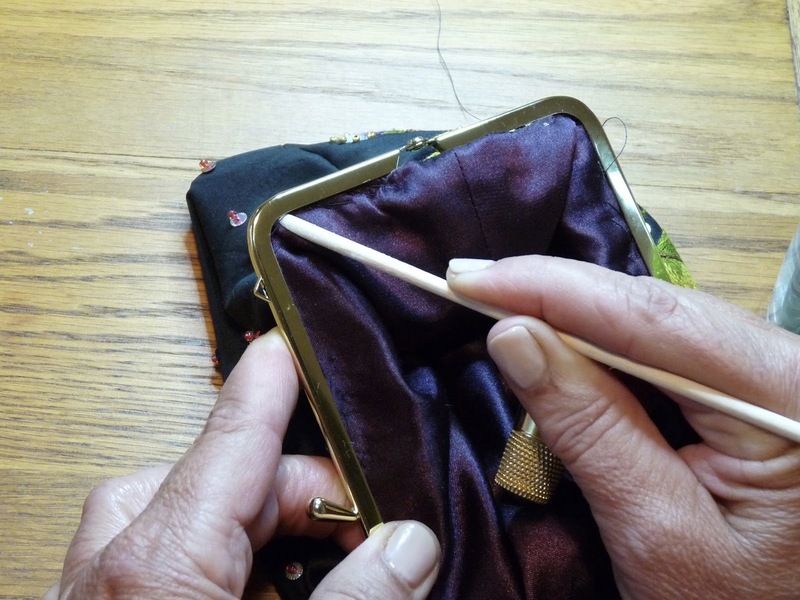 The directions include a fabric handle, but the joins on the purse hardware are just too tiny to make it work. I'll head over to Joann's to see if I can find a small chain that will fit, otherwise I'll have to look online. Can't wait to get this done. If you would like to see all of the posts for this project, this link will take you to them. A quick PSA (Public Service Announcement for those who read in other languages): I am now starting to answer comments in the blog directly below each comment, so please check back a while after you leave a comment. Thanks for all your lovely remarks, I do appreciate them. Now I'm off to do some grocery shopping. We just got a freezer for the new house and it's time to fill it. 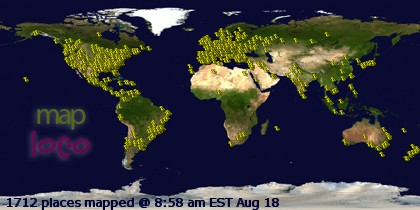 I hope those of you in the Northern Hemisphere are managing to stay cool. It's been pretty hot here, getting to 101 ℉ (38℃) on Monday. Tomorrow we may get some cooler weather, and I must say I am looking forward to it. 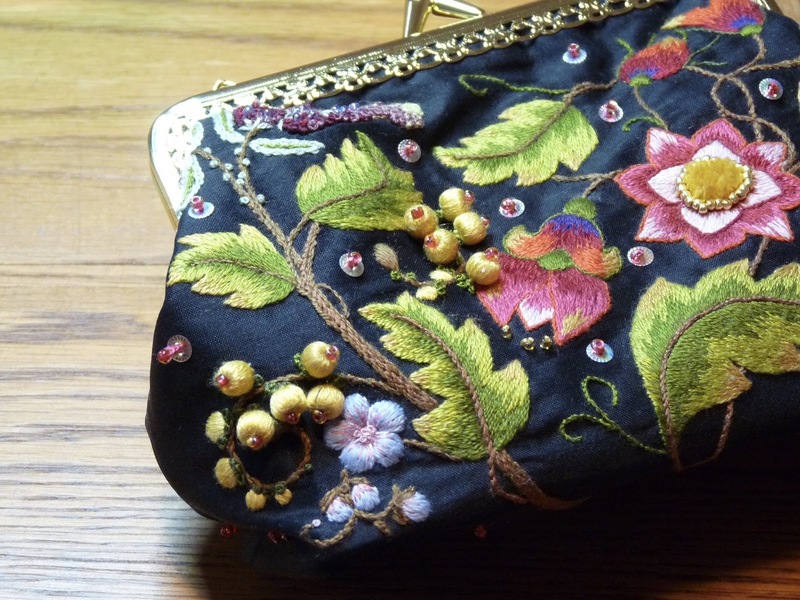 It's been over a year since I posted on the Embroidered Evening Bag, but I've been working hard lately to finish it. Above right, you can see that I've finished the blue/purple flowers. Since this project is worked entirely in Soie d'Alger silks, it's pretty expensive. I had run out of the light blue, but ordered more from Hedgehog Handworks. 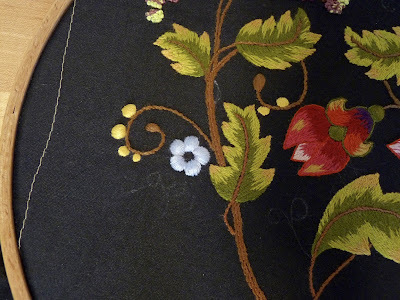 To save the silk for surface stitching, I made the padding of the blue flowers from a corresponding color of DMC floss. As the silk is upwards of $4.90 per skein vs $0.39 for the floss, this is quite a savings, especially if you do a lot of padding. Here I only have the tips of the pink buds to finish, along with the center of the large flower. Since the center will be Ghiordes knots surrounded by beads, I'm saving it for last. This will help to avoid any snagging. If you look at the link to the previous post (over a year ago!) the grapes sort of flowed together in a mash up. I seriously considered taking them all out, but after thinking about this for maybe five minutes, I added a few strategically placed French knots which seemed to make them rounder and more grape-like. What is the mystery bud below the blue flower? I finished the little blue flower, again padding the petals with DMC floss. There are some sketchy lines just below the blue flower that don't seem to correspond with the original drawing. I'll have to figure out just what to do with it. 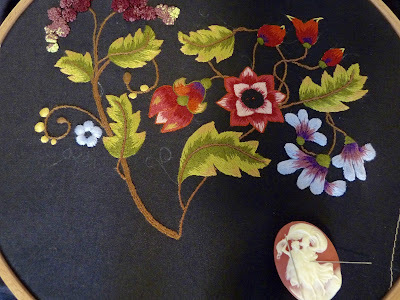 Besides the mystery bud(s), I only have to finish the centers of the blue and pink flowers, the pink flower buds, a few tendrils and stems here and there, and add a lot of spangles overall. Then comes the construction, which looks pretty easy. One aggravation that creeped in a few days ago is that I broke the broke the post of this embroidery hoop. It is a large sit upon hoop so now I have to hold it in my hands to work on the project until I can find a replacement. I'm sure you are all wondering why I have picked this particular project to finish now. Well, there is a very good reason for it. In September, I will be attending the SAGA Convention in Hampton, Virginia. This particular project is from a class my SAGA chapter in California held back in November, 2013, almost three years ago by the talented Susan O'Connor from Australia. Besides wanting to have a nice bag for the annual banquet, I will be taking three days of classes from Susan. I will definitely want to show this evening bag off!